High blood pressure is considered a chronic disease or condition. That means it can be treated, but not cured. If you have high blood pressure and either use medical treatments or lifestyle changes, or both, to lower it, you must keep up with them or your blood pressure will go back up. Systolic pressure, the number at the top of the reading, measures the pressure of blood in the blood vessels when the heart is beating. Diastolic pressure, the number on the bottom, measures the pressure between heart beats. Normal blood pressure is 120/80; 120 for systolic pressure, and 80 for diastolic. It is also normal for blood pressure to be lower than this, down to about 90/60. Readings between 120 and 139 over 80 to 89 are considered to be in the range of pre-hypertension. From 140 to 159 over 90 to 99 is stage 1 hypertension, and 160/100 or higher is stage 2 hypertension. Anything over that is immediately dangerous and requires emergency medical attention. Blood pressure levels fluctuate in normal circumstances. If you have to give a talk at work or take a big exam, for instance, your blood pressure may rise with your stress. However, if your blood pressure levels are consistently too high, you have hypertension. Those occasional, stress-related spikes in blood pressure are nothing to be worked about, but if you are diagnosed with hypertension you could suffer serious complications. Most people don’t experience symptoms of high blood pressure, which is why it is important to measure it regularly. Most people do this at their doctor’s office at each visit, but you can also measure your blood pressure for free at most drug stores or pharmacies. Untreated hypertension can lead to significant health problems. These include a heart attack or stroke, heart failure, an aneurysm (a ruptured blood vessel), kidney damage, vision problems, memory loss, and metabolic syndrome, which can lead to diabetes. For a lot of people with chronically-high blood pressure, there is no single cause that can be pinpointed. It just steadily rises over the years. When this happens, doctors call it primary hypertension. Secondary hypertension is high blood pressure that is caused by an underlying condition like thyroid problems, sleep apnea, adrenal cancer, kidney damage, congenital blood vessel defects, and alcohol or drug abuse. Most doctors recommend that patients with hypertension start with lifestyle changes. Eating a better diet, exercising, stopping alcohol or drug use, losing weight, and quitting smoking can be enough to lower blood pressure. For some people, this isn’t enough, in which case medications may be prescribed. Some hypertension drugs are diuretics, which eliminate more fluids from the body. Others dilate blood vessels, and still others relax blood vessels or slow the beating of the heart. Treatment with high blood pressure medications is not always ideal. They may cause side effects like gastrointestinal upset, headaches, rashes, fatigue, nervousness, dizziness, a cough, sexual dysfunction, and nausea. You can also become dependent on these medications instead of making important lifestyle changes to lower blood pressure naturally. In fact, newer research has found that treating early or pre-hypertension is not necessary and that the benefits of medication do not outweigh the risks. Diet has a huge impact on blood pressure. Being overweight or obese is a risk factor for hypertension, so one important consideration is eating a diet that helps you to either lose weight or maintain a healthy weight. Click here for my weight loss smoothie guide. Beyond simply considering weight, there are other ways that diet can affect your blood pressure. The government and many health organizations promote the DASH (Dietary Approaches to Stop Hypertension) diet for people looking to lower blood pressure. The diet is simple and includes a focus on eating fruits, vegetables, whole grains, foods rich in fiber, and lean proteins like fish, chicken, and beans. It also includes healthy fats, like omega-3s, and low-fat dairy products. The diet recommends limiting saturated and trans fats, added sugar, and sodium, while increasing intake of calcium, magnesium, and potassium. I agree with most of these recommendations, except that I advocate full fat dairy and ample healthy fats. The DASH diet places special emphasis on sodium. It recommends up to 1,500 milligrams per day for anyone trying to lower blood pressure, and 2,300 milligrams to maintain a healthy blood pressure. Table salt is sodium chloride, and sodium has been implicated in raising blood pressure, but the idea that salt is bad for you is changing. A recent study analyzed seven other studies on salt intake and health and found that there was no proof that cutting back on salt reduces the possibility of having a heart attack or stroke or of dying. Another study even found that participants who consumed less salt actually had a greater risk of dying as a result of heart disease. Eating something salty does raise blood pressure, in the short-term, but does it really have long-term consequences? It has long been a part of common wisdom that too much salt is bad for you, but this may not actually be true. Certain types of salt like Celtic sea salt and Himalayan pink salt actually contain a lot of minerals that can be good for you – I’ve written all about it here. So should you cut back on salt? It’s hard to say, and if you already have high blood pressure, it is something you should discuss with your doctor. You can support a healthy blood pressure level by eating the right foods. There are certain ingredients that have a positive effect on blood pressure, but please keep in mind that you should still follow your doctor’s advice if you have chronic or dangerously high blood pressure. Depending on your particular situation, diet may not be an adequate substitute for medication. Leafy greens. Greens, like spinach, kale, collards, romaine lettuce, and others, provide a good ratio of potassium to sodium, and they are easy to sneak into most smoothie recipes without changing the flavor too much. Blueberries, raspberries, blackberries, and strawberries are delicious smoothie ingredients, and according to research, the anthocyanins, compounds that may protect against high blood pressure. One study found that participants consuming beet juice saw lower blood pressure within 24 hours. Beets have a natural sweetness that pairs well with a lot of smoothie recipes, so don’t be afraid to add a little beet or beet juice to your next one. Flax seeds. Eating flax seeds regularly has been linked with lowered blood pressure. Several natural compounds in the seeds may contribute to this effect, so grind some up and add them to your next smoothie. Get the benefit of lowered blood pressure along with fiber and omega-3 fatty acids. Dark chocolate. The natural compounds found in chocolate may reduce blood pressure. Choose raw cacao for your next chocolate smoothie. Click here for my article on cacao and why I think it’s a fantastic smoothie ingredient. White beans. These mildly-flavored beans are rich in calcium, magnesium, and potassium, and low in sodium as long as you rinse canned beans before using them. White beans also add protein and fiber, as well as a nice creaminess to any smoothie recipe. The ultimate smoothie fruit for natural sweetness and great texture is the banana. It also happens to be rich in potassium. In addition to foods, there are some supplements and herbs that may help to lower blood pressure. Before you take any kind of supplement, medicinal herb, or vitamin, talk to your doctor. There may be side effects or even interactions with other medications. Some of the herbs and spices that may help and would make excellent smoothie ingredients include basil, cardamom, cinnamon, ginger, and lavender. Supplements that may help include folic acid, coenzyme Q10, and fish oil. There are also a couple of herbs that have been used in traditional Chinese medicine for high blood pressure. Hawthorn is supposed to be generally good for cardiovascular health and you can find it in pill form, as a liquid extract, or as a tea. Cat’s claw has also been used in Chinese medicine for thousands of years. There is some modern evidence from studies that it may lower blood pressure and you can find it in any health food store. Blend all ingredients together until you get a consistency you like. You may want to blend the beet root first, as it will require a little more blending time. If you use fresh fruit, add a little ice. Try my delicious recipe for a chocolate almond butter smoothie, which includes blood pressure-friendly ingredients like raw cacao, strawberries, spinach, banana, and flax seeds, but make it even better by adding about a half teaspoon of fresh ginger. High blood pressure can be a serious health problem, but if you want to tackle it naturally, with diet and food, talk to your doctor and then try some of these ingredients in your daily smoothie. Have you found relief from high blood pressure through diet and lifestyle changes? Please share in the comments below. I have to avoid all berries due to high sycilates what other fruit can I add instead? Avocado is your best bet. 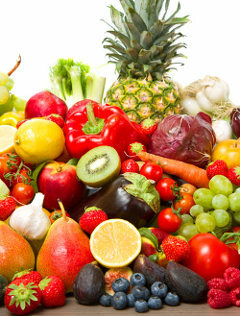 Otherwise small amounts of sweeter fruits such a banana, apple, kiwi, and mango are fine. You did not mention pineapple, something I put in all my smoothies for sweetness. Hi,I have five ingredients for the green heart healthier smoothie but I have to get four more ingredients for this smoothie.does the beet root have to be cooked before I put it in the blender?can I put the collards in the blender? Yes, the beet root must be cooked. Yes, the collards can go right into your blender. You may want to chop or break them into smaller pieces before blending. Also, remove any fibrous stems. I have had hbp for 18 hrs and have been on medication the whole time. It was 240/160 when I found out I had it. My smoothie mix I have every morning has it down in the normal range for the last 2 months. I am amazed that diet could reduce it that much. I feel so much better being off the medication the doctor said I would be on for the rest of my life. That’s fantastic that you’ve been able to lower your blood pressure with diet, Dave. Even better that you no longer have to take medication (for the rest of your life). What is your daily smoothie to keep your blood pressure lowered?? Hi. What do you put in your smoothies? What is your regimen? Dave, what’s your secret recipe? Hey Dave just got diagnosed with hbp.What is your secret recipe? Thanks Dave for sharing !!!! I’m definitely going to try the smoothies and diet I want to get off these high blood pressure medication the doctor said I will have to take them for the rest of my life ,now that I hear your testimony I am going to try my best to get off my medication…. Hi Dave, thanks for sharing what smoothies can do and I am very much interested what fruits and or veggies you put in your smoothie mix. Hope you would share. Thanks. Good morning Dave. Can you share your ingredients. Thank you. My husband is having high blood pressure issues. What is your smoothie recipe you used to lower it? Those ingredients will result in a healthy smoothie, Sam. Ryan, do you have any youtube videos? Please can you help out with the best smoothies recipe for high blood pressure/high cholesterol. The recipe in the article above is your best bet, Olusegun. Steaming is not necessary. Toss it in raw, Courage. Green, Heart-Healthy Smoothie The recipe use banana which doctor do not recommend for diabetics. Any substitute Ryan? Use 1/2 avocado in place of the Banana, Kar.